Beloved and I had dinner at Wangfu Chinese Bistro weeks ago. This Chinese restaurant replaced (thankfully) Teriyaki Boy at the second floor of the building across McDonald’s Tomas Morato. This is actually the second branch in the same street, the first being in Il Terazzo. Beloved had a chance to visit that place, and wasn’t that pleased with the serving size considering the price. So I had a pretty good image that this place isn’t your budget friendly Chinese place. The menu isn’t a purely Chinese list. Some of their items have obvious influence from other cultures. Also, I confirmed that this was indeed one of the pricier Chinese places we’ve visited. I guess the direct competition would be a place like Lugang Cafe. We ordered their Hongkong Beef Curry (368 Php), Chicken and Mushroom Clear Soup (228 Php), Hakaw (98 Php), and Seafood with Dried Scallop Fried Rice (248 Php). For our drinks, Beloved ordered their Teh Tarik (78 Php) and I ordered Calamansi Juice (78 Php). Our hot drinks arrived first in cups. I was quite disappointed in the size, but we were satisfied with the taste. Beloved’s Teh Tarik was not as sweet as your usual milk teas, but other than that, it’s still milky tea. My Calamansi Juice, which I asked for hot, was definitely fresh. Our soup order, like most Chinese-style places we’ve been to, could serve at least three. The Chicken and Mushroom Clear Soup was not in as clear as soup as I imagined. Though soothing, the main star of this simple soup are the bits of tender chicken and mushrooms and other random veggies. Not bad at all. Our rice order, similarly, could easily be divided into at least three cups. Though I would’ve wanted a bit more bits, there’s plenty of seafood bits, basically fish and shrimps and (of course) dried scallop, scattered in their Seafood with Dried Scallop Rice. 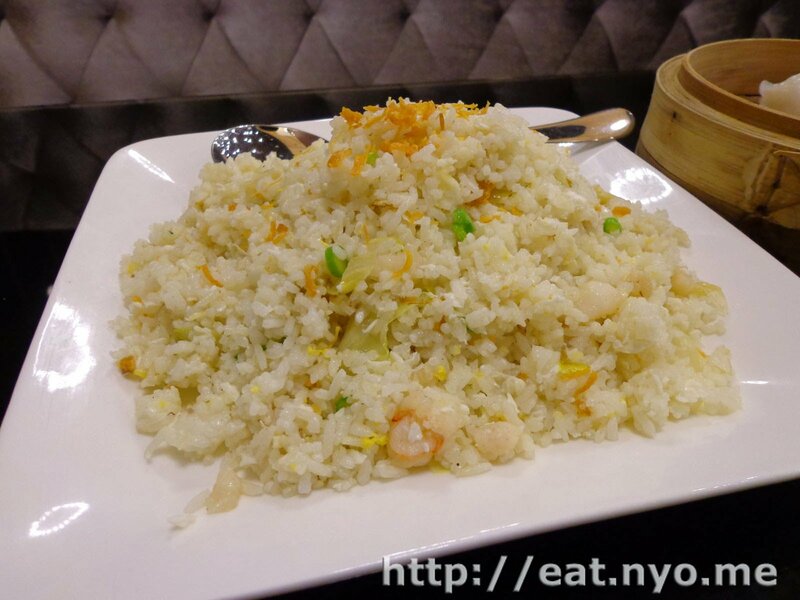 It’s not as salty as the usual salted fish fried rice we had, and most of the flavor comes from the bits of seafood, the rice just barely getting some seafood saltiness. That fact was actually a good thing.The rice didn’t cloy us from the flavors of the Hakaw. 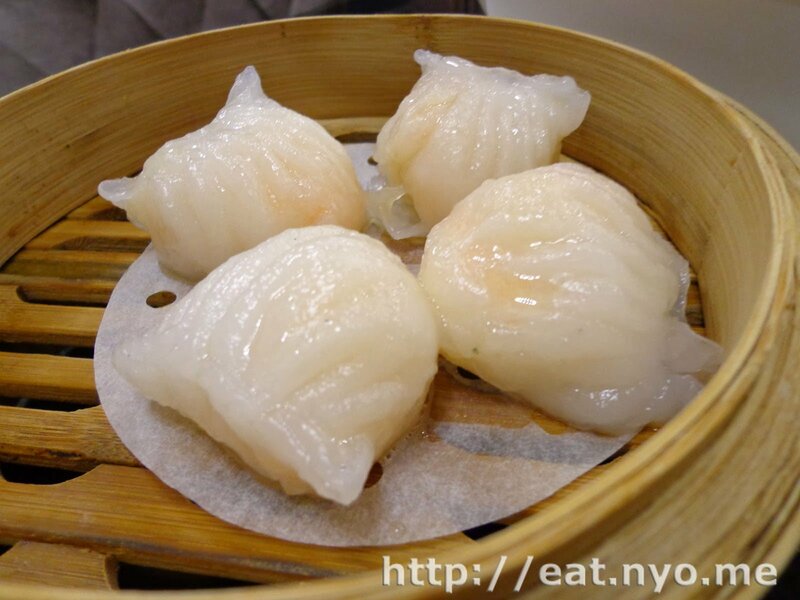 Four of the largest shrimp dumplings I’ve had, this order was probably the best value of the night. Although it’s still a bit flawed in that the wrapping still sticks to the paper, the dumplings were filled with shrimpy goodness. Finally, our main dish to go with our rice, the Hongkong Beef Curry. I don’t really know plenty about curry to tell you what makes it “Hongkong”, but my geographic and historical knowledge tells me that this probably has some British (perhaps Indian) influence. 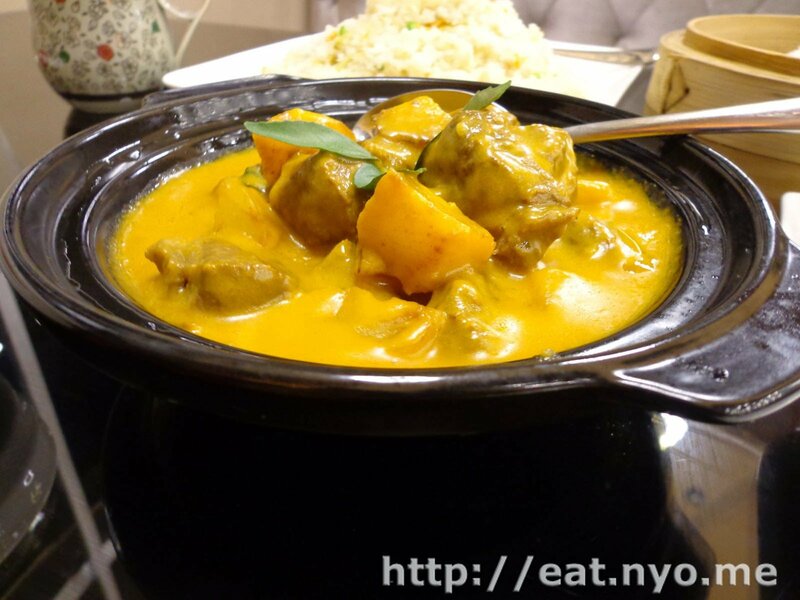 It’s not as milky as the usual Thai curries we’ve tried, and it’s not as spicy as the spiciest curries we’ve had. It’s a well balanced stew. The best part about this was the beef—it’s cooked so tender that it disintegrates down to strings in your mouth. It went pretty well with our rice order. Although we were satisfied to the fact that we had some leftovers (which we happily ate the next day for breakfast), we saw an order from another table that piqued our curiosity. Since we still had space for dessert, we ordered their Traditional Ice Kachang (138 Php). 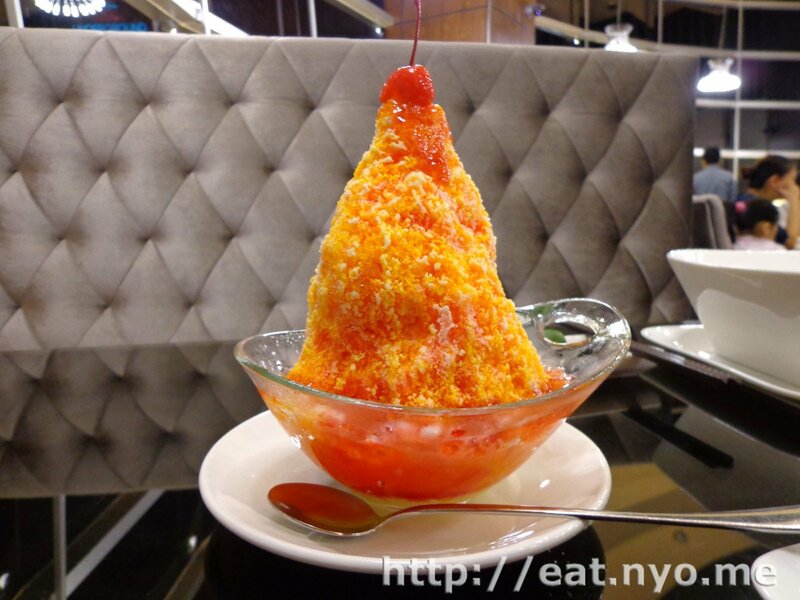 This shaved ice dish is a cross between the Filipino halo-halo and your usual flavored shaved ice. The flavoring was a sweet berry and citrus mixture. Buried underneath the mountain of ice were corn, sweet beans, nata de coco, and I believe macapuno or pandan. I might have missed a few ingredients, but this certainly would savor any sweet teeth and cold dessert lovers. This might just be a bit too sweet for me, but it’s still good. Overall, we were pleased. The only downside of the place is the price tag attached. Plus service charge, it went to almost 1.5k. Nevertheless, the service and food was good. 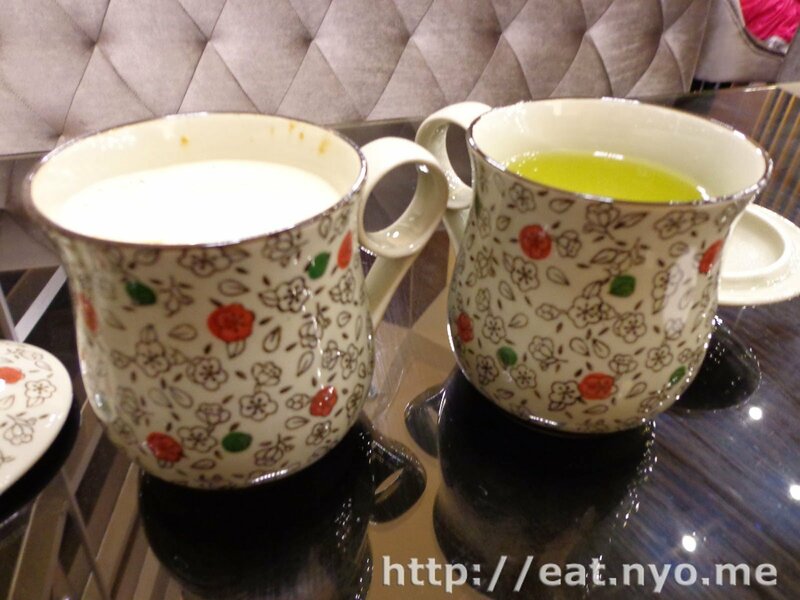 We formerly planned to go back to try out a dish that interested me but didn’t have enough budgeted money at the time. However, we managed to try out the dish in a different place and was disappointed by it (stay tuned). Since this is a pretty expensive place, we decided not to do a revisit anymore. 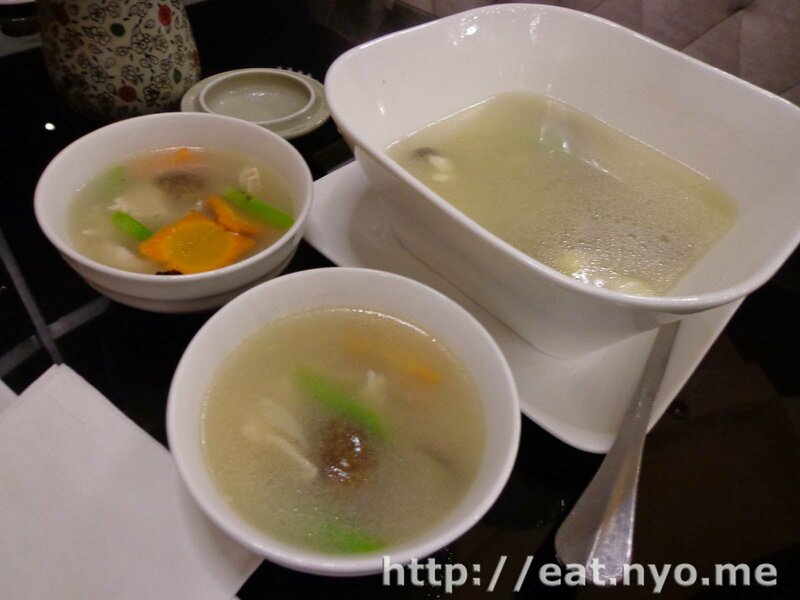 Hopefully, everything is still as good as it was back then at Wangfu Chinese Bistro. Recommended for: Rich Chinese/Asian food lovers. Not recommended for: Poor Chinese/Asian food haters. Smart nomnomnom tip: Most of their dishes can serve at least three, including dessert.